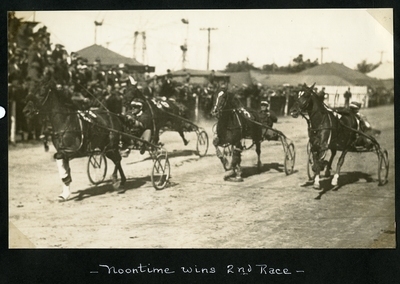 Sepia tone action photo of the finish of the second race of Friday, September 25, 1936 at the Cumberland Fair, West Cumberland, Maine. Photographer Guy Kendall captures four of the six horses in the field of competitors for the Classified Pace. Bay gelding Noontime captured the win followed by Nickdale in second place and Echo Harvester in third.